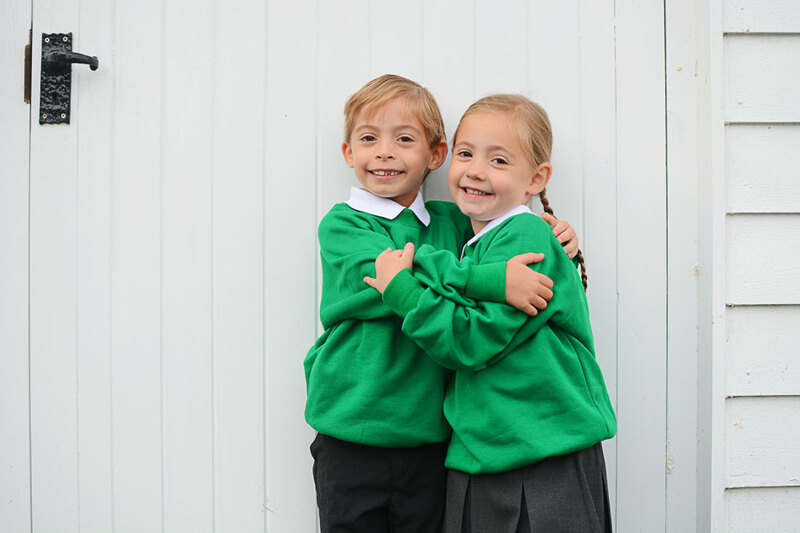 September brings the solid lump of uninterrupted sibling time to an abrupt end. And my goodness has it been a month of change so far. 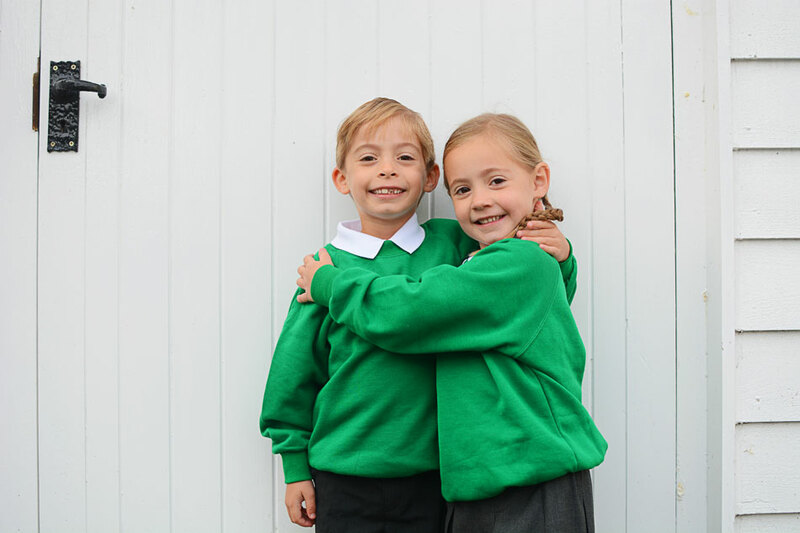 First the little gang lost Dylan to school, and the girls had a week of adjusting to life at home without the one they both totally hero worship. 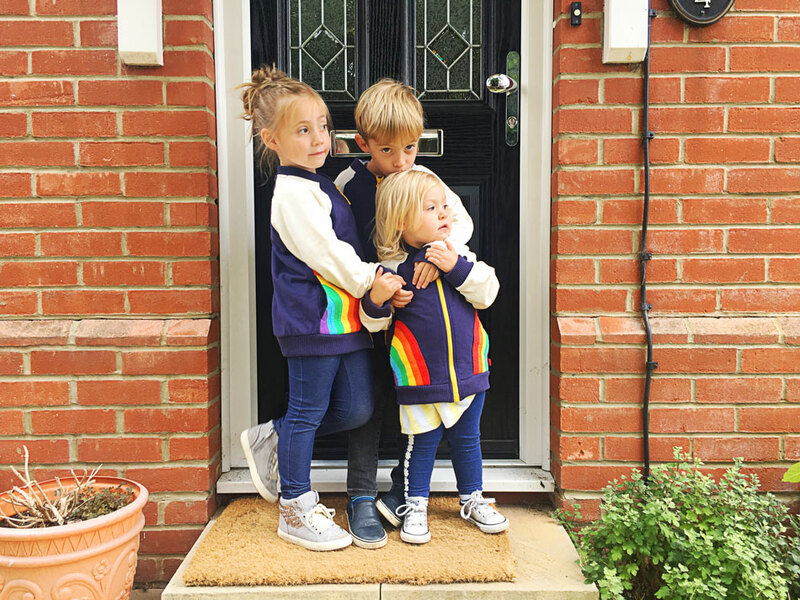 And then just as they settled into that as a new norm, Everly was off to school too, and while this means Dylan and Everly now get the excitement of sharing something new in the form of both being school kiddos together; it's all left Quinn a little forlorn. Its always the way with parenthood, and with life I guess, that just as you get used to things being a certain way, they change. Change is the only thing we can rely on. And give us another week or so and this new normal will feel just that... normal. These photos make me really smile this month. 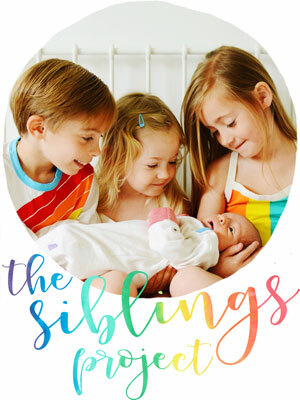 Mainly because I can remember the fun of taking them; Dylan proudly grabbing his sisters, Everly striking her best poses and Quinn shouting "cheeeeeese" at the top of her voice. 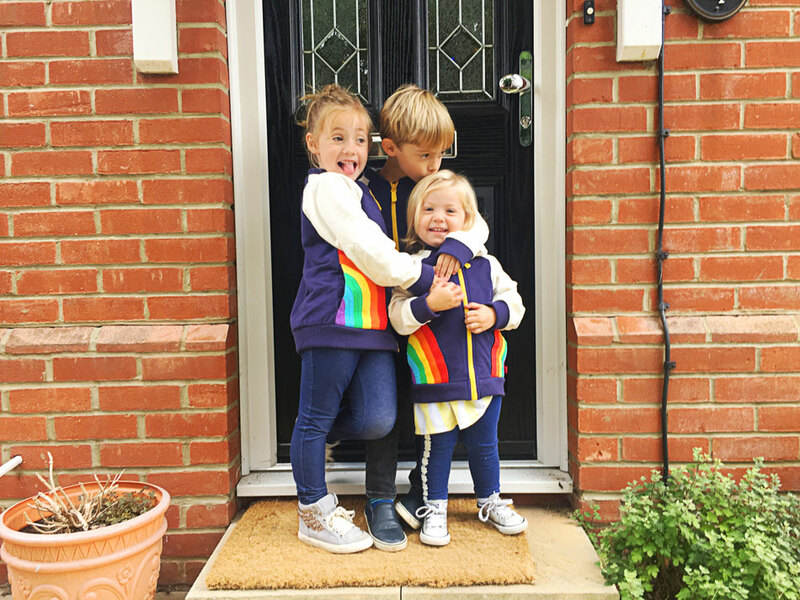 I've always sworn I'd never match my kids; we love to rock the coordinated thing, but they have their own personalities and I think they should be allowed to shine. I tend to dress Quinn (quite literally) in all the colours of the rainbow, because she looks fab in brights and she gravitates to bright colours. Everly also loves bright colours, and no outfit is complete without either something a bit glittery, or a dress. And Dylan - well - Dylan doesn't care that much about what he wears... except when the girls outfits are similar, at which point he feels thoroughly left out and wants the same. And honestly they LOVE them. 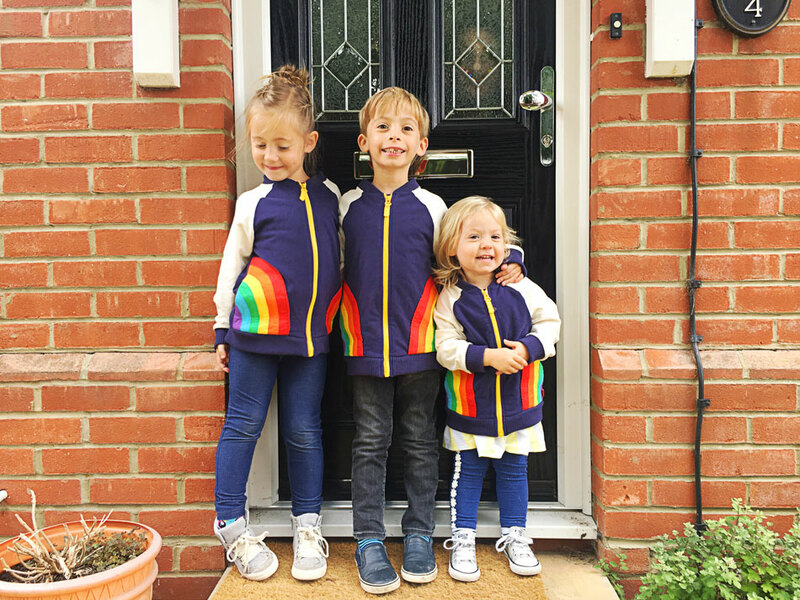 Partly because they feature rainbows and yellow zips (yellow is a firm favourite in this house) but mostly because they can all match. 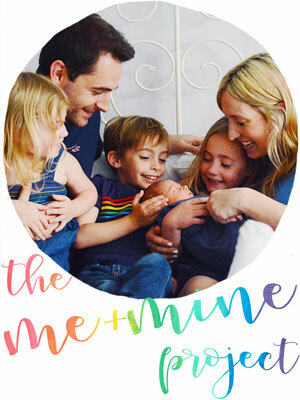 So as much as I may not be the biggest fan of matching kids, I might just be won over. 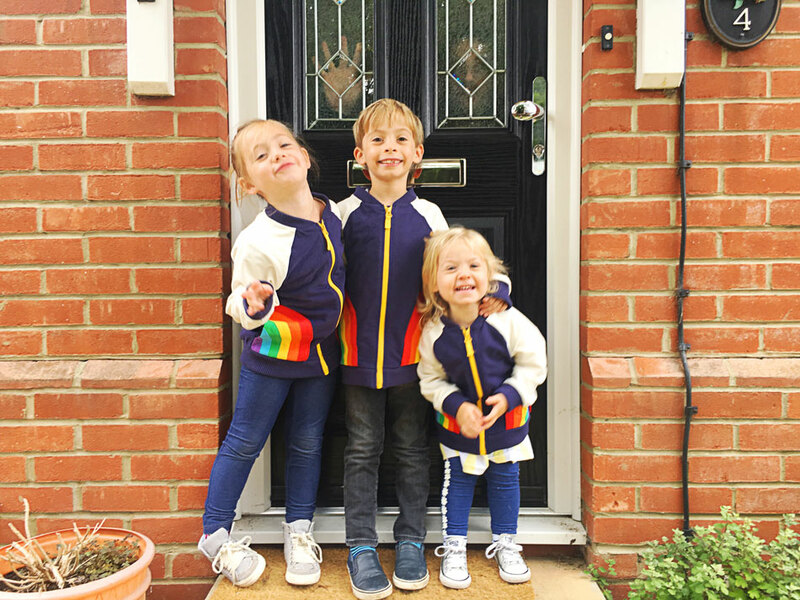 These three are all so proud to be part of their own little gang, so I guess it's only natural that they'd like having their own little tribe uniform. And I had to include these following snaps too, even though they only feature two thirds of the bunch. 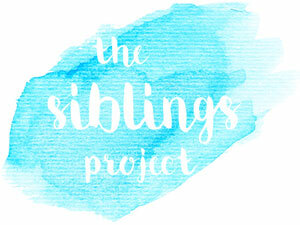 Because it's been a significant sibling milestone for this month. Have you ever seen a face prouder than Dylan's? Too cute. I can't wait to see what you all have to share this month, and make sure you pop by my cohosts (Amber, Carie, Donna, Katie, Keri-Anne and Natalie) to see what they've been up to this month too. 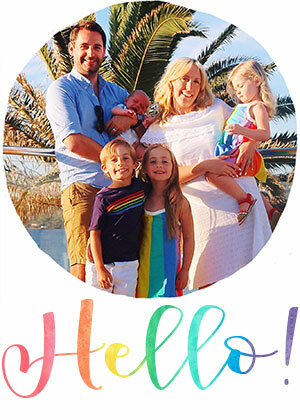 I swear your three get cuter each month! Such happy little faces! 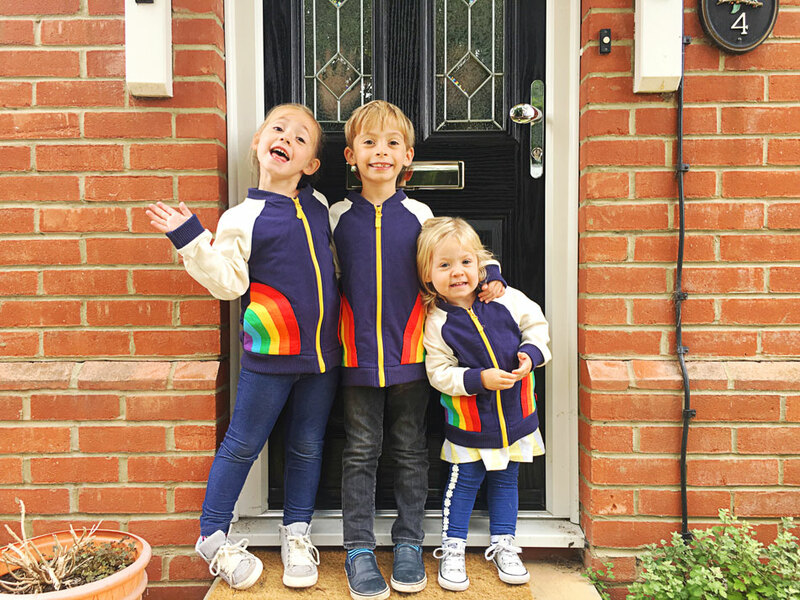 love those matching jackets! wish i could dress my 2 in them but my 7year old is a fusspot and wouldn't wear it!